Practice Yoga, Yoga Lab, and Yoga House will co-teach YogaCAN Sunday, April 28th. Founder and Chairman of YogaCAN Joel Waltzer has announced the opening of registration and participating yoga studios for YogaCAN 2019. Joel Waltzer founded YogaCAN five years ago after losing his wife Jane to breast cancer. Beginning as JaneCAN, the event was originally created as an opportunity for family, friends, and community to support Jane and raise money for the Cancer Alliance of Naples. Following Jane’s passing, her legacy lives on through the annual YogaCAN event. Since its beginning in 2014, YogaCAN has raised over $250,000 for local families in need of financial assistance during cancer treatment. 100% of YogaCAN’s proceeds are donated to the Cancer Alliance of Naples (CAN), a spectacular local organization whose mission is to offer non-medical financial support to families battling cancer. CAN provides financial aid, resources, and support to help cancer patients and their families avoid eviction, ensure lights and water stay on, provide gas and food cards, and other need based assistance during cancer treatment. “In the midst of her most difficult battle, Jane was miraculously able to find gratitude in the fact that some families facing the same hardship aren’t blessed with the same support systems she had. It was her declaration of gratitude that initially attracted me to CAN, as they aim to accomplish just this type of wholesome support during life’s most trying battle,” adds Waltzer. YogaCAN will take place on April 27th and 28th, 2019. The Sunset Social – an evening of socializing and celebration at the Naples Grande Golf Club – will be held Saturday, April 27th beginning at 6:30pm There will be passed hors d’oeuvres, wine and live music performances. This portion of the event serves to cast a wider net to engage more people in the YogaCAN mission, and to offer additional exposure for CAN. 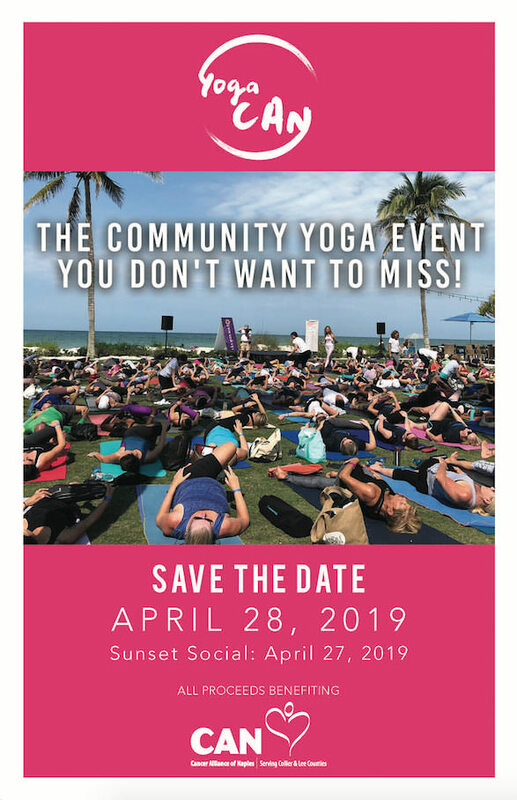 The yoga program on Sunday, April 28th will begin at 10:00am at the Naples Beach Hotel. Waltzer and Jodi Bisogno, Executive Director of CAN, are scheduled to speak at the event. Since the first year, the Naples Beach Hotel has offered their beachfront lawn to YogaCAN to host the yoga class. The owners of Practice Yoga, Yoga Lab, and Yoga House will co-teach participants in a practice of Vinyasa yoga designed for all levels. A kid’s yoga class will be taught simultaneously with the adult yoga class. In addition to the yoga classes, there will be a silent auction in a ballroom adjacent to the field. Fresh and healthy food options will be served in the ballroom provided by the Naples Beach Hotel. YogaCAN 2019 is in search of additional sponsorships and auction items. If you or your company would like to sponsor the event or donate an auction item, please contact lisa@naplespowerplate.com. YogaCAN is a rain or shine event; in the case of poor weather, yoga will be held in a ballroom at the Naples Beach Hotel. For more information, visit https://www.yogacan.org/. For more information about the Cancer Alliance of Naples, visit https://cancerallianceofnaples.com/ or call 239-643-4673.